I’ve made this little jacket for a colleague of Muds, who is expecting her first baby in June and for whom I have a lot of admiration and respect, even though I have never met her. Her story is inspirational and one from which many of our young people could learn a lot. She is a young polish woman who far from coming over to our country to live off tax payer funded handouts, came over and took a job as a NHS cleaner to pay her way through university, with the sole aim of improving her circumstances through hard work and determination. This paid off when, a few years ago, she secured a good job in the same company and department as Mud. She continued to work hard and now has a good position within the department and there are many British Nationals, both young and old, who seem to believe that the world owes them a living, who would do well to follow her example. Climbing down from my soapbox, I’ll now tell you about this charming little jacket. 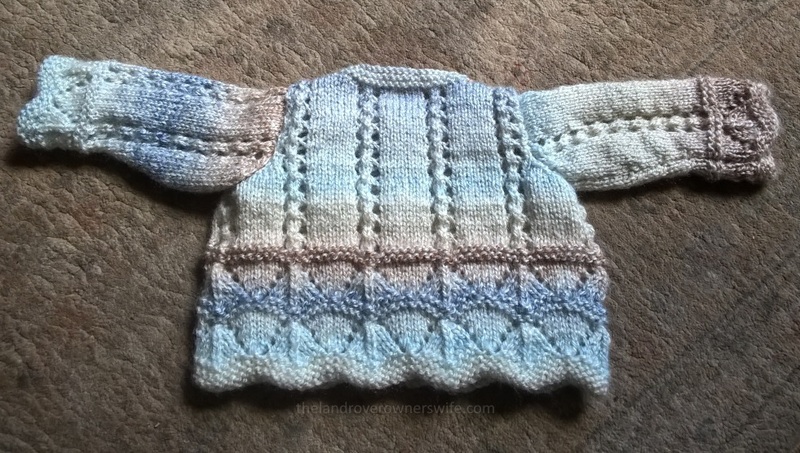 The yarn is a firm favourite of mine for baby boys and I’ve used this colourway for several little garments now. It’s the J. C. Brett baby marble double-knit, 100g (268m), shade number 5 and is 100% acrylic. 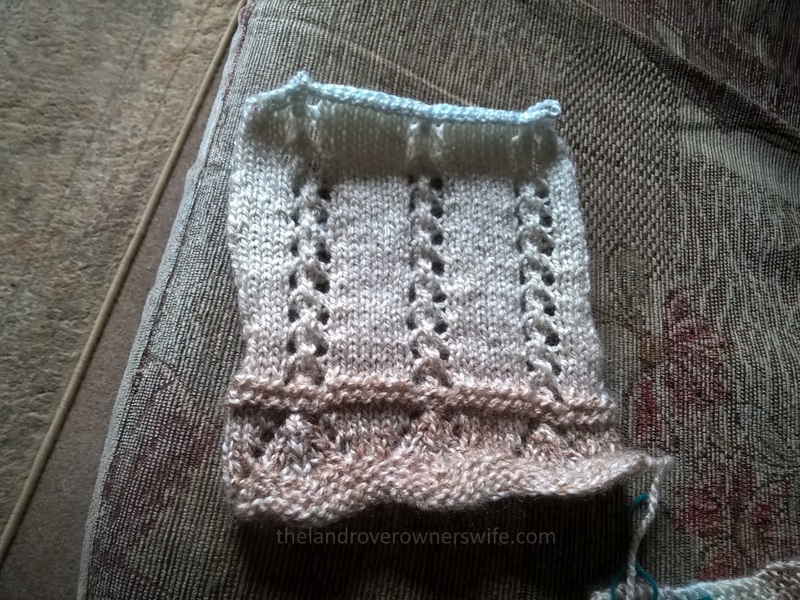 The yarn is lovely and soft, handles beautifully while being worked and, I’m told, washes well. 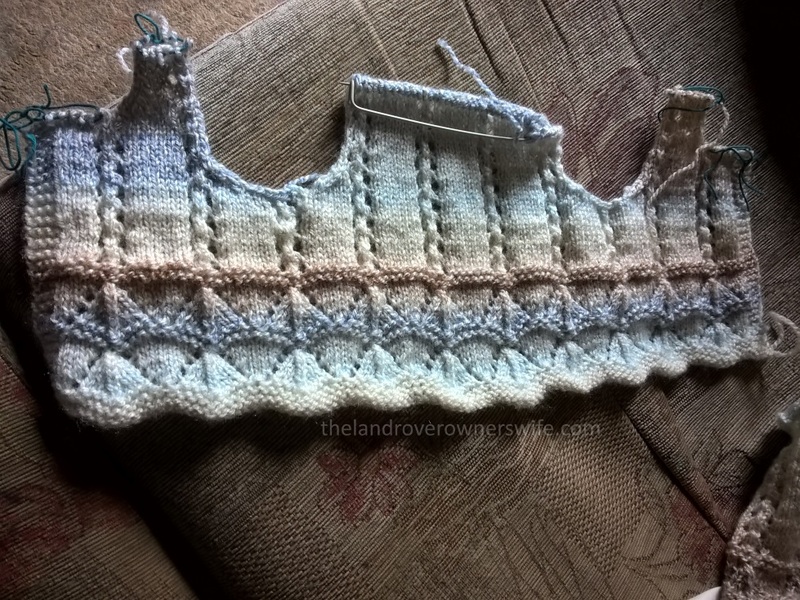 I love the blue and brown colour way of this shade and it always looks really effective once knitted up. I found the pattern on the freepatterns.com website. 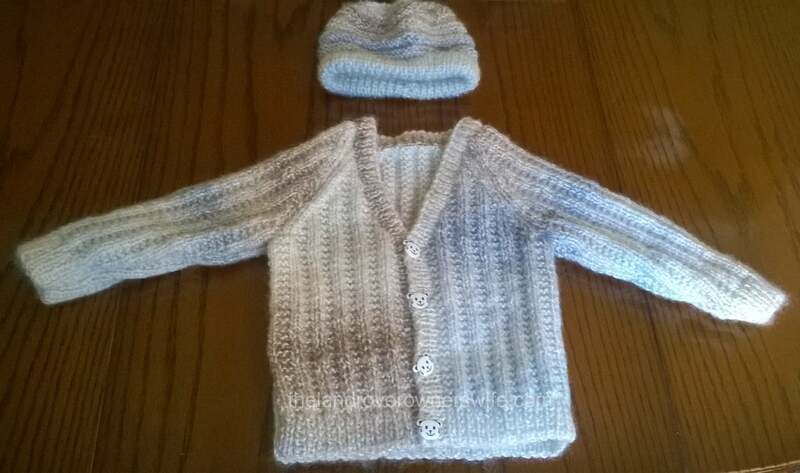 A blanket and hat are also on the pattern but I chose to complete the jacket in this case. Please be aware though that there are a couple of revisions at the very bottom of the pattern, to correct mistakes in the instructions which you need to read before you start or, like me, you’ll find yourself frogging the work back a couple of rows in to start again – which was annoying as I knew it wasn’t right but continued anyway, so have only myself to blame and will remember to follow my instinct next time. So with the stitches cast on for a second time, I steadily worked my way through the pattern which was in a new format for me, in so much as the front borders, front sections and back are knitted as one piece until the required length from bottom edge to armpit is reached, at which point, some stitches from each end are placed onto stitch holders, leaving just the centre stitches to be worked on until the neckline is reached. 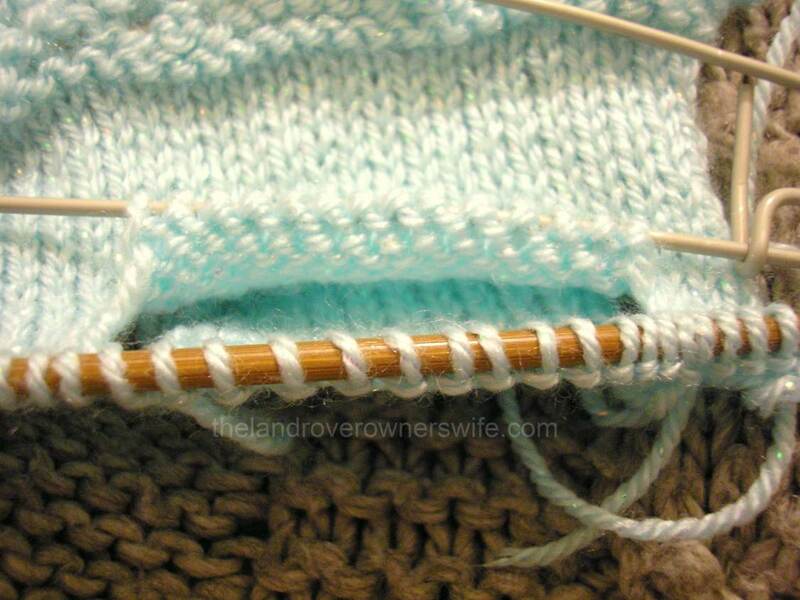 The centre section is actually the back of the jacket and once this has been worked to the neck, the remaining stitches are placed onto another holder whilst the yarn is reattached to each set of end stitches in turn and then these are worked up to create the two front sections, complete with border. 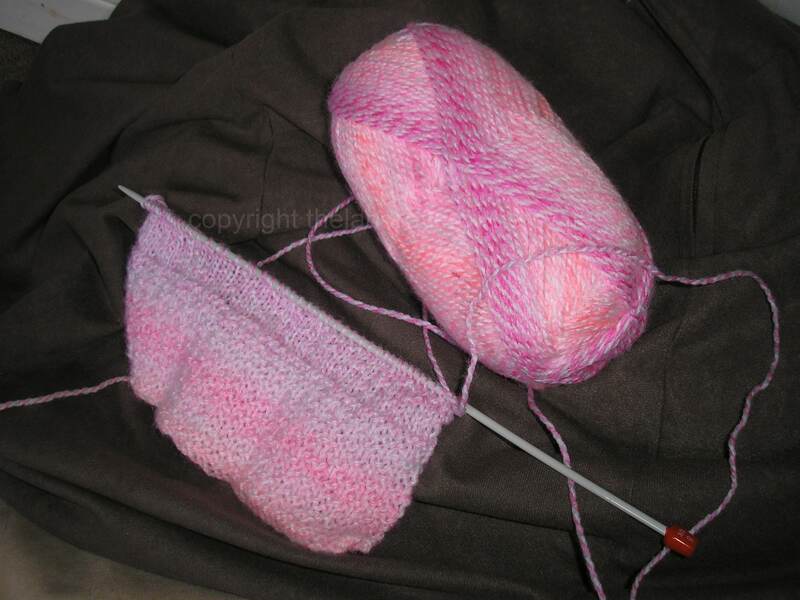 when the second pair was done, the first was passed over the second to cast them off. And so on and so forth until the 9 stitches for one shoulder were all cast off, 19 stitches for the back of the neck were knitted across and then the second set of front and back shoulder stitches were cast off in the same way. The end result was a tidy and perfect shoulder seam join on both sides. 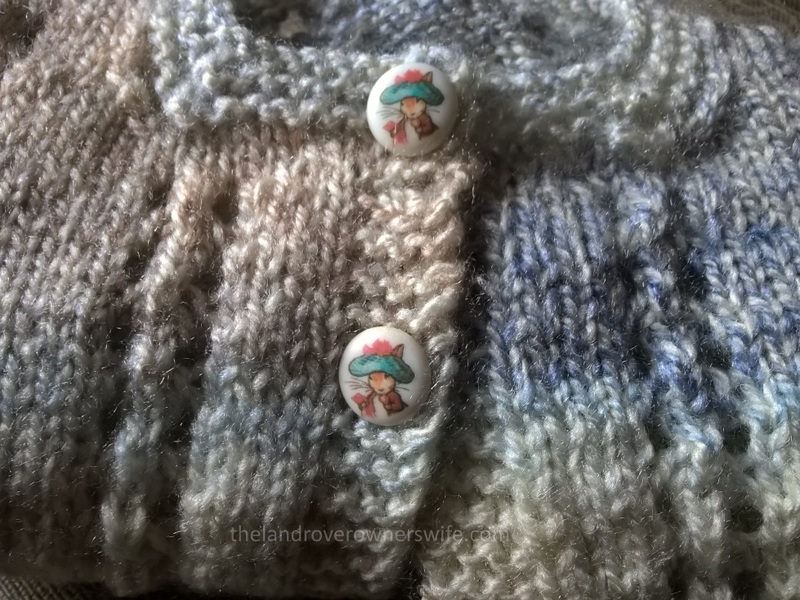 The rest of the neckband and sowing up was quickly accomplished, two rather cute little Peter Rabbit buttons were sewn on and after a quick press, the garment was carefully wrapped in white tissue paper, tied with a shiny silver ribbon, ready for delivery today. 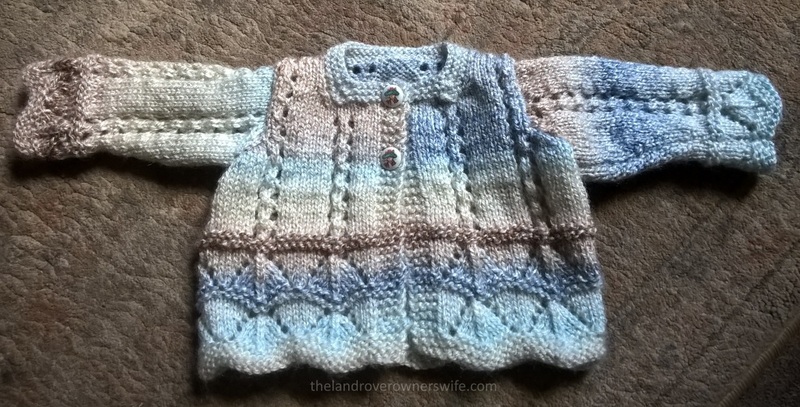 All in all I think this jacket has become my favourite baby knit to date, as I really love the shell and column detail, and would be suitable for both girl or boy. Categories: .... on knitting, Baby knits | Tags: Baby knits, fashion, home makes, J. C. Brett baby Marble, knitting, wool, yarn | Permalink. Categories: .... on knitting, Baby knits | Tags: Baby knits, clothes, crafting, home makes, James C Brett Baby Marble DK, knitting, wool, yarn | Permalink. Categories: .... on knitting, Baby knits | Tags: crafting, home makes, King Cole, knitting, Peter Pan P955, wool, yarn | Permalink. Categories: .... on knitting, Baby knits | Tags: crafting, home makes, King Cole Babyglitz, knitting, Peter Pan P955, wool, yarn | Permalink. 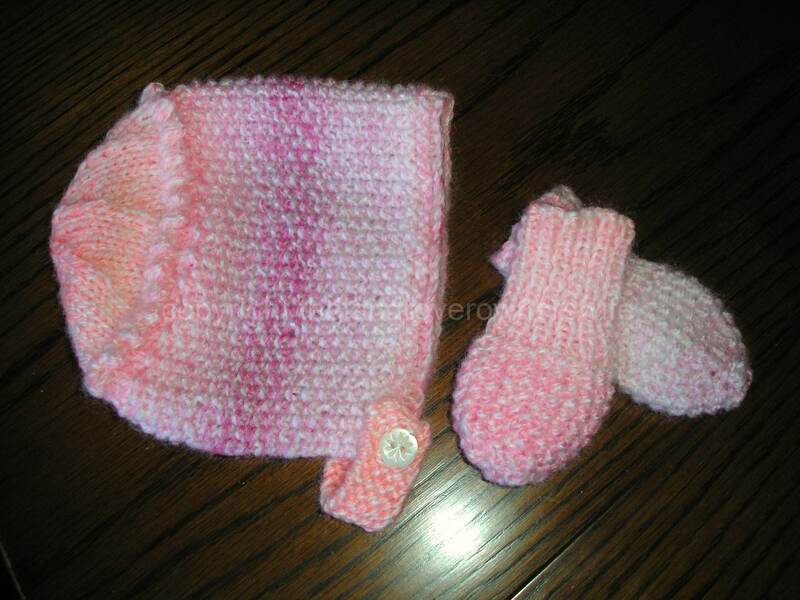 Categories: .... on knitting, Baby knits | Tags: bonnet, craft, crafting, home makes, knitting, mittens, wool, yarn | Permalink. 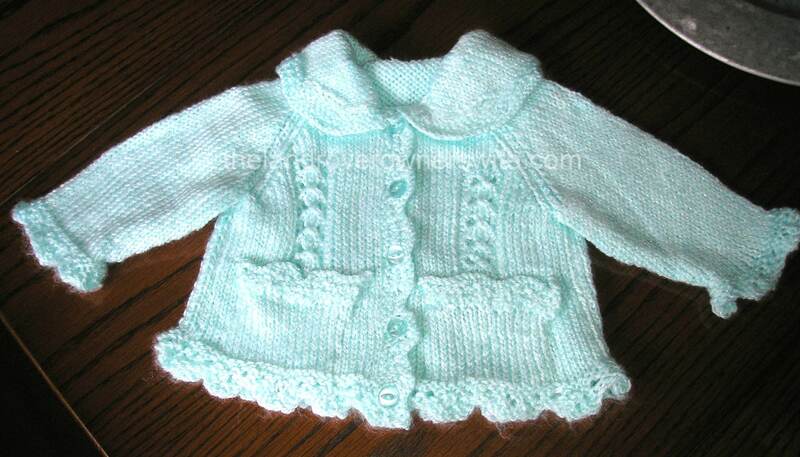 Categories: .... on knitting, Baby knits | Tags: baby jacket, Baby knits, Double Knit, knitting, Peter Pan P838, Robin Bonny Babe, wool | Permalink. It seems that there is quite a baby boom going on around here at the moment, with two of the four teachers in school both expecting (1 baby boy and 1 baby girl) within weeks of each other, one of the mums due any day (another little girl) and one of the neighbours with a brand new baby girl. 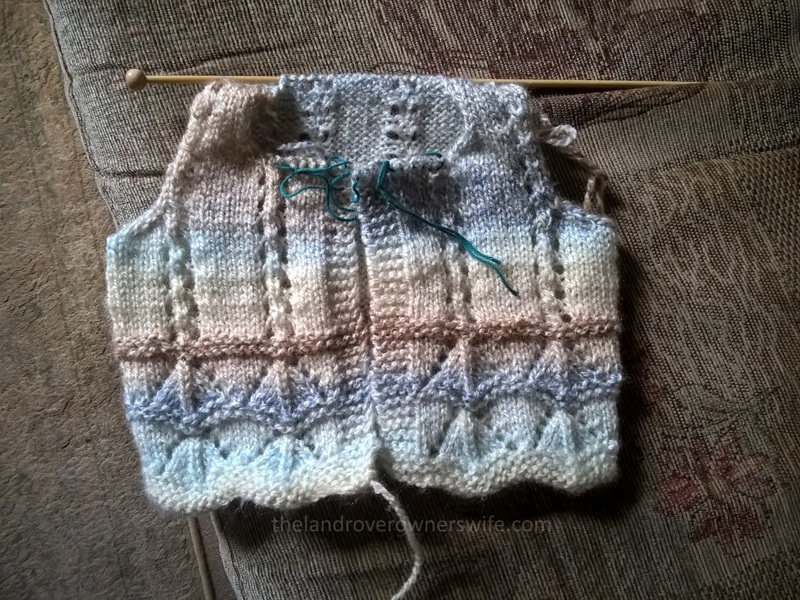 I love knitting baby clothes – they are beautiful, cute and so quick to knit and so I rummaged through my wools and patterns, got out my needles and on Tuesday night, whilst Mud was surfing the net, I made a start on a baby jacket. I can’t remember the make of the wool I used but I believe it was described as a ‘marble’ effect baby wool. 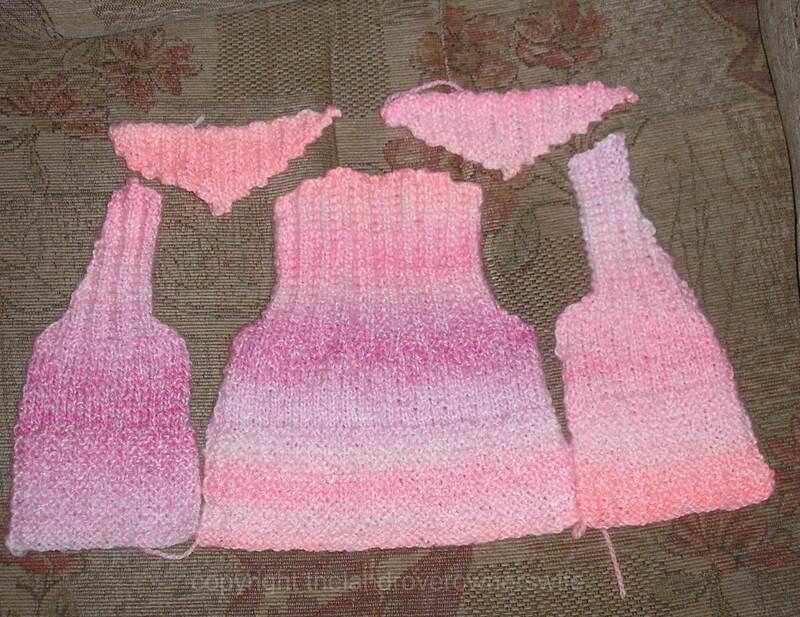 The needles were size 3.25mm and 4mm and the pattern was Sirdar 1802. The finished pieces before I put them together to see what the jacket would look like. 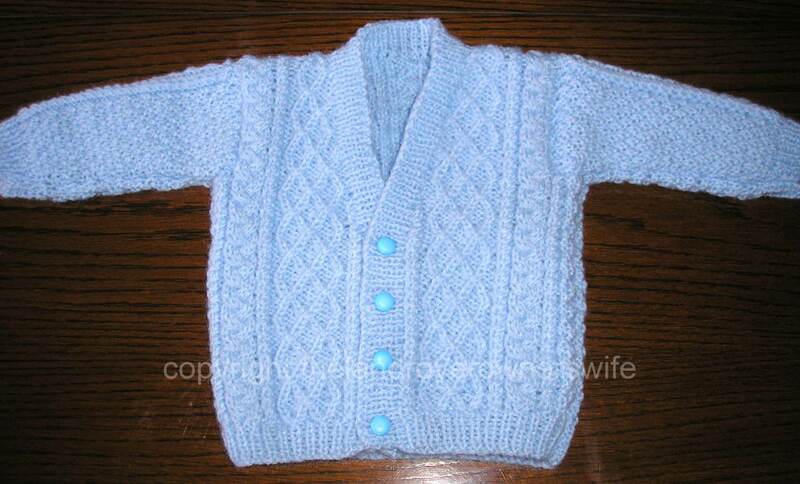 Categories: .... on knitting, Baby knits | Tags: baby jacket, handmade, knitting, Sirdar | Permalink.